The first days of fall are officially upon us, but my mind is already in the thick of holiday planning. In less than a month, I’m hosting Accessorize for the Holidays for 35 of my most fabulous media friends and fashion influencers. This annual holiday soiree is a chance to showcase innovative and dazzling accents that will infuse sparkle into your holiday season, from boots that can take you from the office to the after party, to a luxury travel kit that will rock your world. 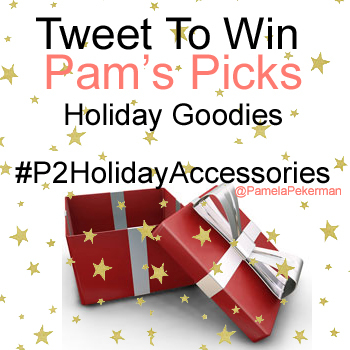 As always, I’m giving you a chance to win items featured at Accessorize for the Holidays. Contest ends October 19th at 11:59pm PST. ** Two winners will be selected, one who tweets the above line (see 2.) and one who shares the best holiday accent (see 3.). Good luck and tweet you later! Whiting & Davis is as American as apple pie, and now well into their second century, the 135-year-old brand is going back to its roots and re-launching a jewelry collection. Industrial, sleek and modern, despite having signature styles that predate the computer, gasoline cars and Madonna, the collection will appeal to minimalists and glamour gals alike. Whiting & Davis mesh tear drop earnings (silver $175, gold $750) picture below at center, for example, can be your go-to all year long, from accenting a little black dress and sky-high pumps, to playing up jeans, a grey turtleneck and willies.